We always help out our residential customers! Child locked in the house? We can you get in! Lost your key from under that rock? Just give us a call to re-key your house. Benny’s is Your Door Locksmith Too! Who has a key to your Residence? Former residents and their friends? Your neighbors? Real estate agents, tradesmen, maids, gardeners, relatives, kids, friends? The list may be endless! Be sure only those you want to have a key and access to your property are the only people with a key to your castle. Ask us about patented key control and your options to prevent unauthorized key duplication. Protect your property, ask us for the options available. All security equipment can be integrated into the same access control software system. Call Benny's today at 813-837-2898 to get started. Employees with 24/7 access may pose a security and safety risk. Are you sure that you are in control? We recommend that you start with a patented lock and key system to prevent unauthorized key duplication, use an insurance complaint safe and file cabinet for fire and burglary protection, a good perimeter alarm and appropriate security anywhere money, information, inventory, and equipment are exposed. The use of closed-circuit television cameras is also a deterrent to thievery as well as a method of providing information to prosecute. An electronic access control system also can be installed to allow access to personnel at necessary times, and record the arrival and departure times of all employees as well. The cost to implement a total security solution is generally less than the loss or “shrink” of most businesses. With the advent of wireless communications and outstanding mechanical and electronic equipment plus the use of preventative maintenance programs, you can guaranty a satisfactory return on your investment. If you have none or part of a total solution and desire to tighten things up in 2017, call us today for a FREE consultation and put more profits in your wallet! How do you improve the security of your business? If you are doing business with us already, chances are you have satisfactory operating code compliant hardware in use at your business, a key control system to prevent unauthorized key duplication, maybe an access control device to monitor arrivals and departures from offices or areas in the building, perhaps a safe or insulated file cabinet and maybe even an alarm…all are steps to being more secure. The “systems integration” however is better secured with written documentation on how it all is supposed to operate and with specific instructions for managers and employees! You’ve heard the old saying, “Plan your work then work your plan.” The security and safety surrounding your business is a great place to demonstrate clear understanding! You have people, property, equipment, inventory, and information to protect. There are better security products available today, many at a terrific value to help you in your quest and we can help you with your options. Let’s look at what you can do. Assessing Risk: Where are we? It means a walk-through, evaluating operations and identifying possible weaknesses. Establishing Policies & Procedures: This is how we do it here! It’s evident through documentation a written “here is how we do it here” for every aspect of your business from how to handle cash and receipts to how to lock up at the close of business if you do not have this, it must be developed. Install Barriers: You can’t wish the problem away! Barriers include hardware, such as exit alarms, cameras, safes etc. as well as time clocks, money bags, and a better communication plan. Barriers are installed to prevent loss not inhibit operations. Publish, Train & Implement: Communication is the key! When written instruction is developed it must be published in a “company operating manual” and each employee is trained in his or her specific area or the whole. The system is tested and then any changes are implemented for all. Audit Compliance: How are we doing? It’s critical. What good are making changes if you do not measure the success or failure? Anticipated results are charted and actual results compared…you will know where you are! As a business owner, we know your money is valuable, call us today and save more! Keep your storefront looking great with a properly swinging door. Electronic Locks and Access Control. 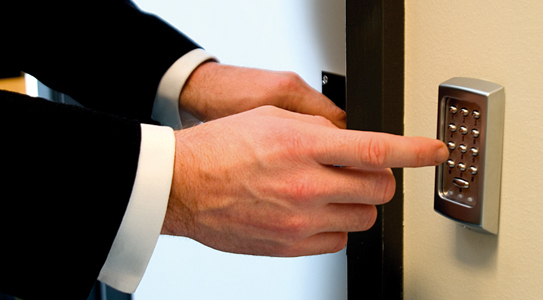 Re-key your building to enhance key control. Install new safes to protect your revenue or inventory.